Animals feature prominently in the Bible. 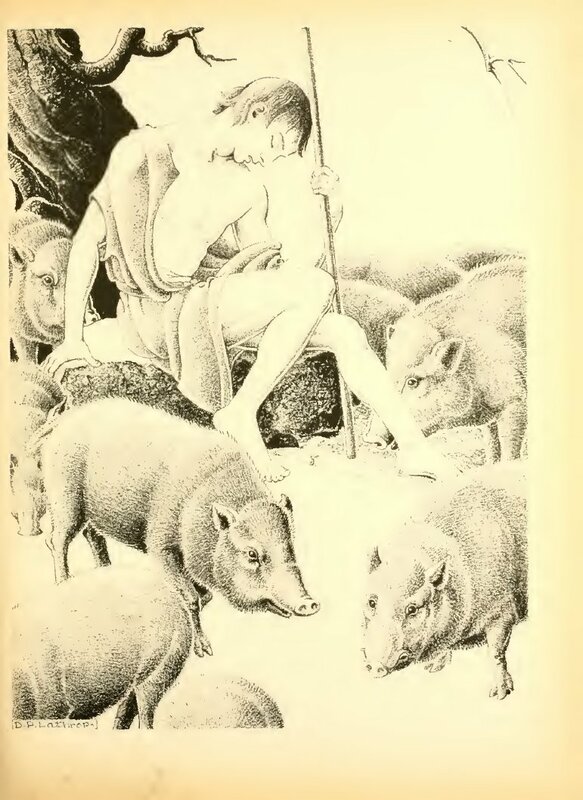 Animals of the Bible: A Picture Book collects passages from the King James Bible, selected by Helen Dean Fish, that relate to animals, and pairs them with illustrations by Dorothy P. Lathrop. For children’s literature, two awards are preeminent: the Newbery Medal, first awarded in 1922, for children’s literature; and the Caldecott Medal, first awarded in 1938, for picture books. Each has been awarded to some truly outstanding literature, over the years. It has also, apparently, been awarded to some less-than-excellent books. Animals of the Bible is less of a picture book, and more a series of drawings, each with an (extended) epigraph selected from the Bible. One can hardly criticize the quality of a set of Biblical quotations, each at most, perhaps, a dozen verses together, but it can be said that the text certainly forms no story, nor teaches anything in particular, nor has any coherent theme. It’s more what I would expect from a Bible-themed calendar than a Caldecott winner. Even the illustrations are something of a mixed bag. The animals are, as the introduction insists, generally relatively lifelike. The humans, though… well, just look at them. The prodigal son, there, looks as flat and oddly-posed as a thirteenth-century Madonna. Worse, really–especially in comparison to the substantially more realistic swine. I suppose it was overly optimistic of me to assume that this book must be very good, just because it was a Caldecott winner–particularly since it was the first Caldecott winner. It’s remained in print, all these years, on strength (I imagine) of that award. But it doesn’t measure up to its successors. Vanessa Mouse is terribly shy. She can’t even bring herself to say “hello” to her classmates. Making friends, she thinks, must be the scariest thing in the world! Will Vanessa ever have a friend? Say Hello, Vanessa, written by Marjorie Weinman Sharmat and illustrated by Lillian Hoban, is a children’s picture book, with charming pencil illustrations. This is a fun one. Poor Vanessa is far too shy to speak to her classmates, worrying that they’ll look at her funny teeth and furry face, and reasoning that, after all, everybody already has enough friends. Her mother convinces her to give it a try, but at first she speaks much too quietly, and afterward much too loudly, to make a friend. Eventually, though, she speaks up in class, spelling a word–tooth–and one thing leads to another, and she makes her first friend, Quincy Moose. The illustrations are nice–plain and simple pencils with just a bit of pink coloring. The writing is simple and smooth and fun to read, and Vanessa’s very quiet or very loud “hello” is set in a smaller or larger typeface, which is cute. 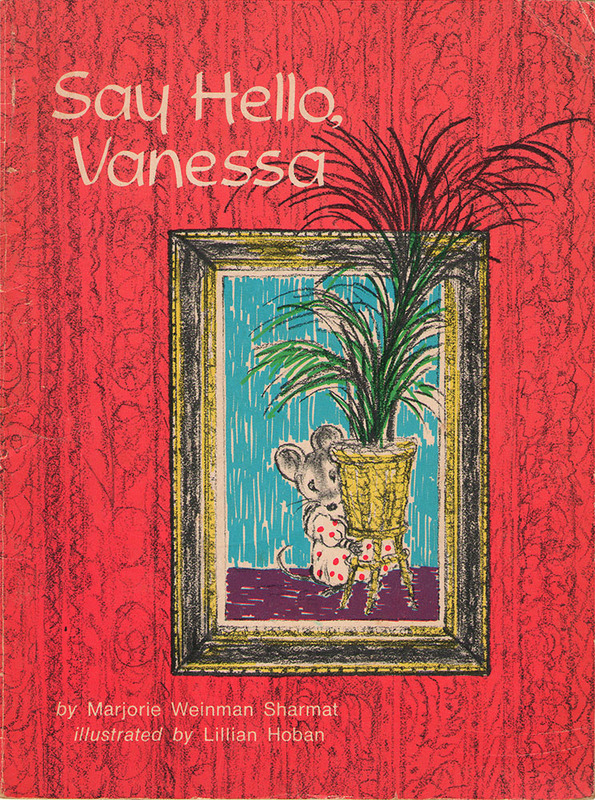 Say Hello, Vanessa is a fun and worthwhile children’s picture book–certainly worth a look. I’d like to say that great works of art have been built on less, but I doubt it’s true. However, I Want My Hat Back, written and illustrated by Jon Klassen (who received the 2010 Canadian Governor General’s Award for his illustrations in Cat’s Night Out by Caroline Stutson, and worked on the animated film Coraline), is a lovely children’s book, all the same. The story is simple: the bear, pictured on the cover, has lost his hat, and wants to find it again. He asks the other creatures he encounters whether they have seen his hat, but none of them have–or so they say. It’s difficult to convey the humor of the book without simply including the whole book in this post. The simple, sparse illustrations, together with the simple, repetitive dialogue, are charming, and the ending, when the bear realizes where his hat is, and goes to retrieve it, is hilarious. The calm, understated way the bear goes about asking after his hat, and his despair when he can’t find it (“What if I never see it again? What if nobody ever finds it? My poor hat. I miss it so much.”) combine to make a very funny scene, too. Though I’ve not tested this one with kids myself, the prevailing sentiment seems to be that both children and adults find it very funny. I personally recommend it to anyone looking for a humorous children’s book, and anyone who just wants their hat back. What do different kinds of ducks eat? Why do ducks fly south for the winter? Are ducks very good swimmers? And, when they do swim, why don’t ducks get wet? The curious child will learn plenty about ducks from Ducks Don’t Get Wet, a Let’s-Read-and-Find-Out Science Book by Augusta Goldin, illustrated by Leonard Kessler. Like What Makes Day and Night, Ducks Don’t Get Wet is interesting and informative, and the illustrations, though sometimes a little odd, go well with the text. Also like What Makes Day and Night, Ducks Don’t Get Wet includes some experiments children can do at home to help them understand why ducks, as the book says, don’t get wet. There’s a newer edition than mine with illustrations by Helen K. Davie. It looks to have much more realistic illustrations, compared to Kessler’s version, but it seems a shame to miss the strangeness of Kessler’s illustrations. Either version should be good, though. Ducks Don’t Get Wet is another wonderful book in the Let’s-Read-and-Find-Out Science Books series, and a great choice for children. It’s educational and fun–you can’t go wrong! Some animals leave for warmer climates when winter approaches, while others store up food or prepare in other ways. When a big snow comes and covers up all the food, the animals must rely on the kindness of an old man and woman who feed them to help them through the harsh winter. The Big Snow by Berta and Elmer Hader is a children’s picture book which receive the Caldecott Medal in 1949. It tells of how different animals prepare for the coming winter, and how they survive after a big snow. The art is charming. Some pages are black-and-white, done in pencil, while others contain watercolors. The penciled illustrations are quite detailed, and the watercolors are lovely, too. Although the animals are ultimately secure, I think it’s a little sad that all their preparation was for naught. It makes the deer, who believed that there would be food for all, growing plentifully, seem quite foolish. Then again, they are just animals. The Big Snow is an excellent children’s book, featuring many creatures, beautifully illustrated. Definitely recommended.